John McAuley with his latest ribeye steak offer. With Father’s Day on Sunday, local West Belfast family butcher, McAuley’s weekend deal is the perfect way to treat any father on the special day. 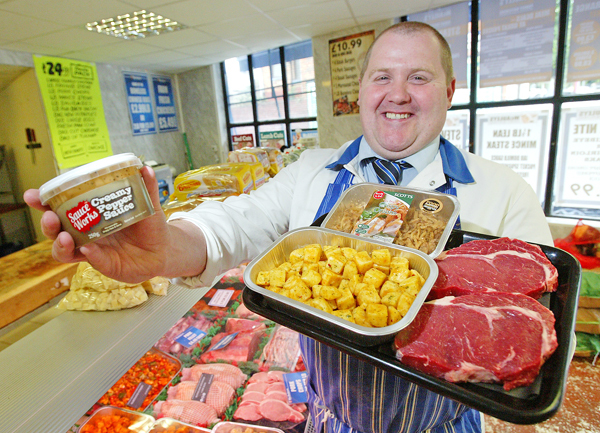 Voted best butcher in ‘Best of the West’, the value offer for just £10.99 is two 8oz Ribeye Steaks, a tray of Garlic Chilli Potatoes, a tray of Crispy Onions and a tub of Peppered Sauce. “I think there will be great interest in it for those who want to stay in and watch the football and treat their father with a nice steak dinner. It’s all locally sourced good quality beef which is important for the customers. People want to know what exactly they are eating so we pride ourselves on excellent products and a reliable service to our vast-growing customer base. It’s a fantastic offer and the customer is getting everything they would want on their plate for a nice dinner. We do different deals constantly so there are always great offers in our shops,” he added. McAuley’s is based on the Stewartstown Road, Falls Road and Springfield Road in West Belfast, so pop into one of the shops this weekend to avail of a fantastic Father’s Day weekend deal!